Once I cleared security at BKK I had no problem finding the 24 hr. lounge. However, while I was checking into the lounge, I was told that the priority pass only allowed me to stay in the lounge for 2 hours. Luckily the lady that was helping me informed me that there were 6 other lounges in the airport that accepted priority pass, and I could bounce around from lounge to lounge all night. It turns out they aren’t too strict on the two hour rule. I spent about three hours in two separate priority pass lounges working on my computer. It was the middle of the night in Bangkok, but the middle of the workday back home, so I able to get a lot done. The airport was pretty much a ghost town for the majority of the night. At one point I was the only one in the lounge! I left my second priority pass lounge around 6 a.m. to check in for my next flight that departed for Tokyo around 8 a.m. From BKK to TYO I would be flying on Japan Airlines (JAL). After checking in, I was given access to the JAL lounge, which is where I spent the next two hours until my flight. At the JAL lounge I took another shower, and ate my favorite lounge meal up to this points. I don’t know what I ate, but it was fantastic! They had a noodle bar set up in lounge, so I watched a Japanese man in front of me make his noodles, and I just copied exactly what he did! 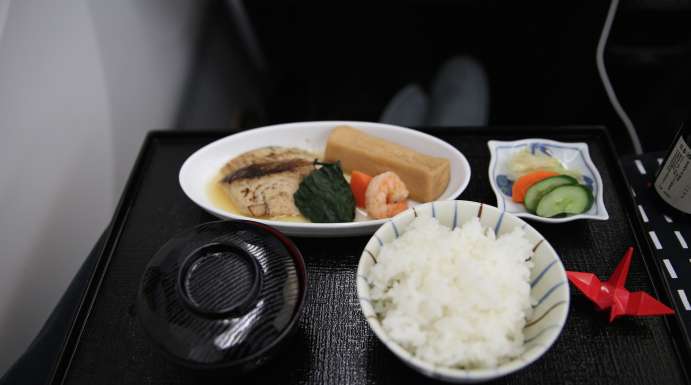 After my shower and noodles, I boarded my first business class flight on JAL. I had an awesome experience on JAL. The flight was on one of their new planes so everything was modern and fancy. The food was amazing, and the service was by far better than any I’ve received up to this point. 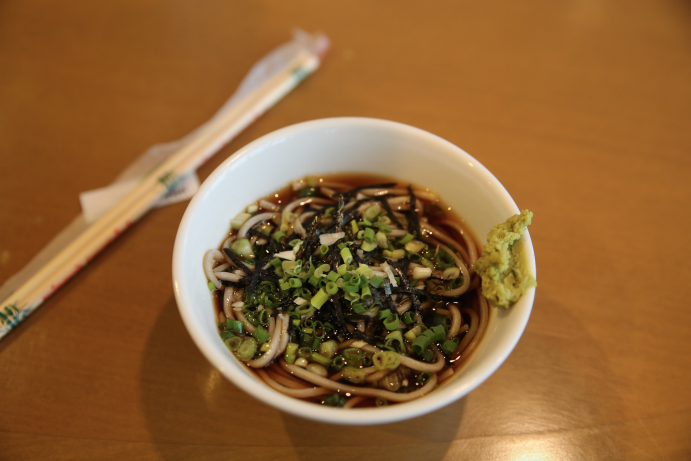 As I said before, I love trying new things, so the Japanese style meal was perfect! I thought this was the main course, but apparently it was only appetizer! The main course was grilled sea bass with sticky rice and miso soup! I don’t know if you’re recognizing a trend here, but I’ve basically been constantly eating for the last two weeks. After my meal it was around 10 a.m. local time which meant it was 10 p.m. CST so I slept for the remain 3:30 hours of the flights. This is where my schedule started to get thrown off for the first time. We landed in Tokyo around 4 p.m., which is 2 a.m. CST, and I had 2 hour layover before boarding flight for Dallas. 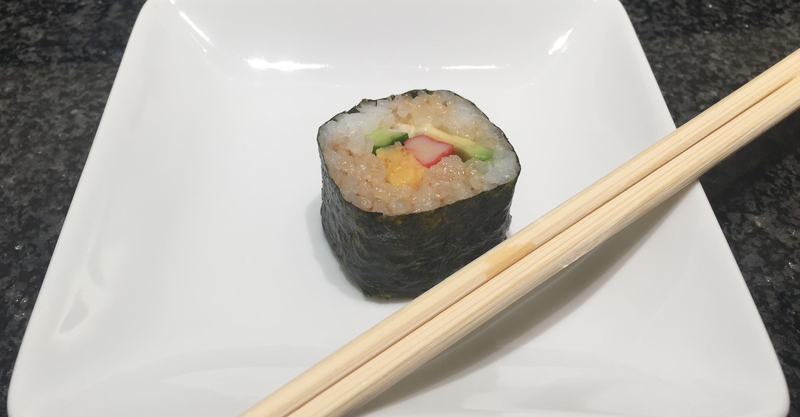 So I was basically up for a few hours in the middle of the night, but it was ok because it gave me time to visit the Admirals Club and eat some Japanese sushi! I boarded my flight for Dallas around 6 p.m. local time (4 a.m. CST). Since it was still the middle of the night for me, and I had eaten way too much over the last 4 days, I opted to skip the four-course dinner and go straight to sleep! I arrived back at the DFW around 4 p.m. and headed straight to the Centurion Lounge! I had passed on the last meal in the plane in order to save room for the better food in the Centurion Lounge! This means I did something I never thought I would do… I made it an entire 11 hour flight without eating, but it was much needed after all the indulging I had done over the last four days. The food in the Centurion Lounge was well worth wait! Since I missed an entire workday on the flight back from Tokyo, I spent my 5-hour layover catching up on work in the Centurion Lounge. I tried to book a free massage while I was there, but unfortunately I waited too late and all the spots had filled up ☹ (I know, poor me). 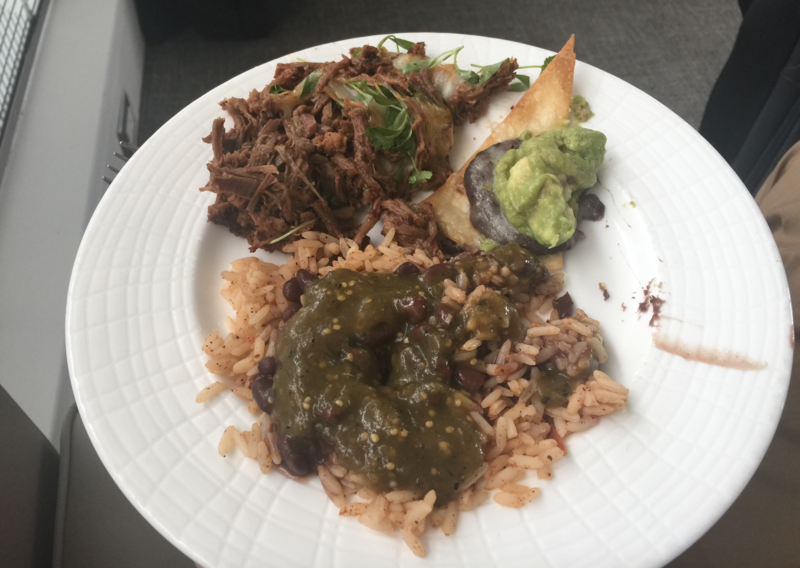 Poorly plated but delicious Mexican food at the DFW Centurion Lounge! I boarded my flight back to Sao Paulo around 9 p.m., and started having a little déjà vu. This was my first repeat flight of the trip. Since I’ve already covered this flight in a previous post, I’ll spare you repeating the details. Except to say that the salmon meal I had was by far one of the best meals I’ve had on an American Airlines flight. I arrived in Sao Paulo around 9 a.m. the next morning, which means that I officially completed 1/3 of my mileage run. Now, I just have to do it all over again, TWICE! My body is holding up surprisingly well, but it crazy to think I’ll do this two more times in the next 8 days!